OK, please don’t switch off right away. Despite the nerdy title, this page will be written especially for the 99% of people who are not engineers. No equations or engineering jargon will be used, I promise. The reason for dedicating a special page to the second law of thermodynamics is simply because it has profound implications on our energy future and, as stated on another page, the world is totally and utterly dependent on cheap and abundant energy. The average developed world citizen consumes the energy equivalent of 140 slaves working 24/7 (almost 600 manual laborers working 40 hour weeks). If all of us suddenly lose the cheap work done by these 600 diligent laborers (aka fossil fuels), our society will instantly crumble to dust. Our energy future should therefore be at the very top of the list of priorities of each and every world citizen. So, let’s get straight to it then. The implications of the second law of thermodynamics as it applies to our energy future is this: energy will always try to move from more concentrated forms to less concentrated forms and can only be made to do some useful work during this transition. The more well-known first law of thermodynamics states that energy cannot be created or destroyed, but this law has very little to do with the energy future of our civilization. We can have all the energy in the world, but if this energy is not in a sufficiently concentrated form, it is physically impossible to make it do any meaningful work for us. The fact is that we are constantly moving closer to the point where new difficult-to-access fossil fuels (especially oil) become too expensive to extract and many people think that climate change might already make our futures very uncomfortable even if we manage to magically cut all CO2 emissions right now. It is therefore pretty obvious that we seriously need to start planning for the decarbonization of our economy. 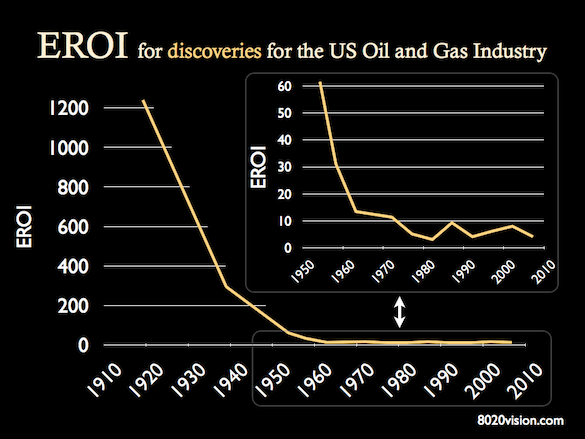 As the global energy consumption figure below shows, however, we sure have a very long way to go in this regard. 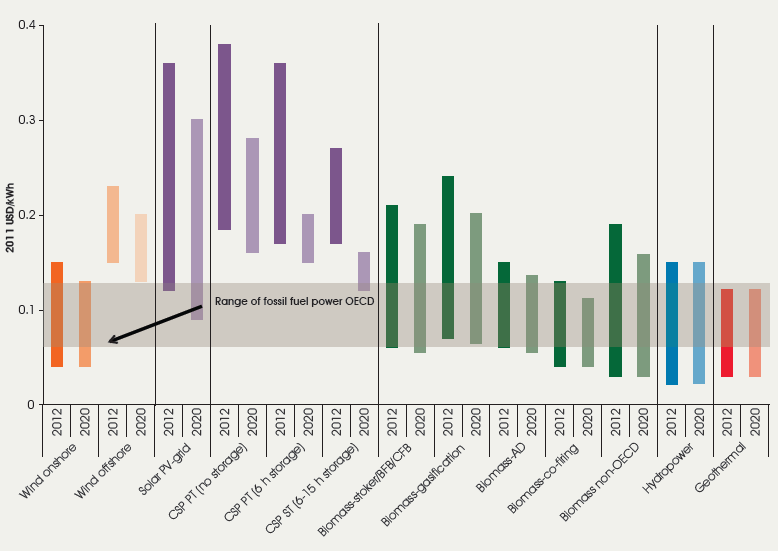 Most people intuitively feel that this transition must be led by renewable energy (the purple line at the bottom of the graph). However, as this article will illustrate, the second law of thermodynamics poses significant challenges to this ideal. 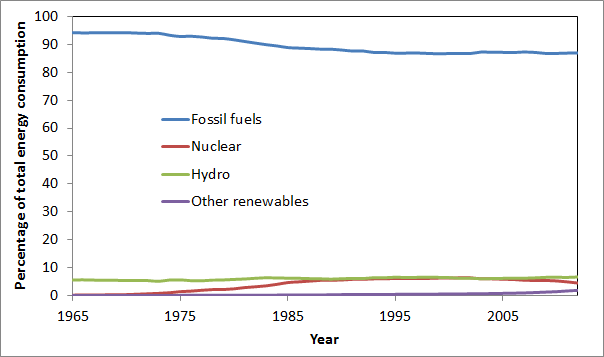 The declining red line (nuclear energy) is a much more thermodynamically favoured option (actually much more so than fossil fuels), but faces a great deal of public resistance. 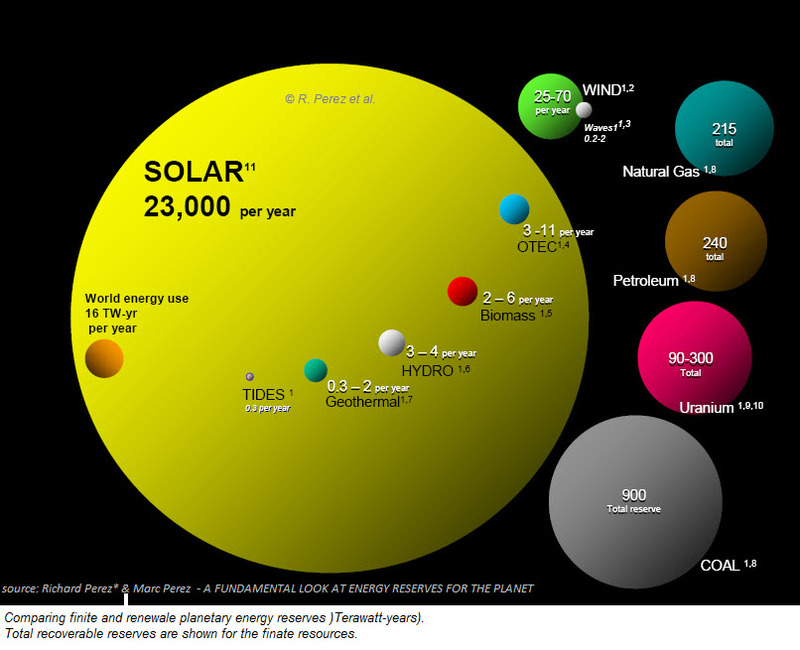 Renewable energy from solar, wind and bio-matter certainly has the fundamental potential to carry our civilization into an age of sustainable prosperity (illustrated by the figure below), but the vast majority of people severely underestimate the challenges that these technologies will face from (among several others) the second law of thermodynamics. The primary aim of this page is to inform readers about this fundamental limitation and grant some much needed perspective. Optimism about renewables is nice, but misguided beliefs that the market will deliver renewable energy solutions and allow us to continue our exponential economic expansion after the age of fossil fuels unfortunately belong in the same league as Santa Clause and the Tooth Fairy. It is vitally important that the world wakes up to this fundamental fact ASAP. 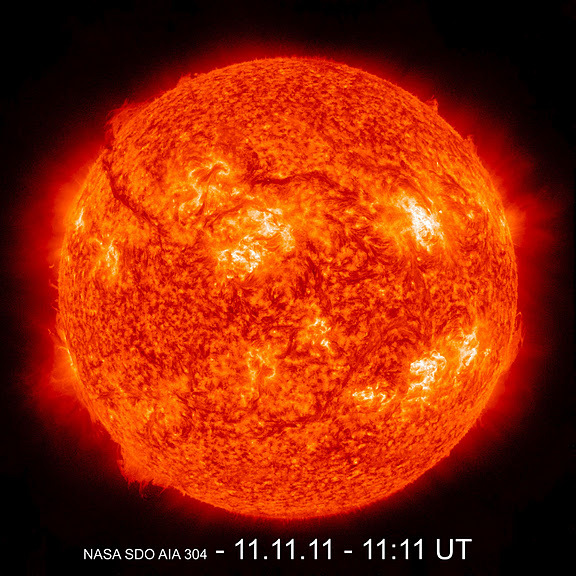 Ultimately, all of our energy (except for nuclear and geothermal) comes from the sun. You might have heard that the earth receives enough sunlight in one hour to satisfy human energy needs for an entire year, but, thanks to the second law of thermodynamics, this massive amount of energy is totally useless to us unless we manage to massively concentrate it from the diffuse form in which it hits the surface of the earth. And unfortunately for us, energy does not like to be concentrated. Just like many other things in nature, it naturally diffuses away from regions of high concentration and towards regions of low concentration. Our task of concentrating the sunlight hitting our planet into useful forms like electricity or biofuels will therefore be very, very challenging. Let’s take a closer look at the challenges related to the two options we have for solar energy concentration: technology and photosynthesis. 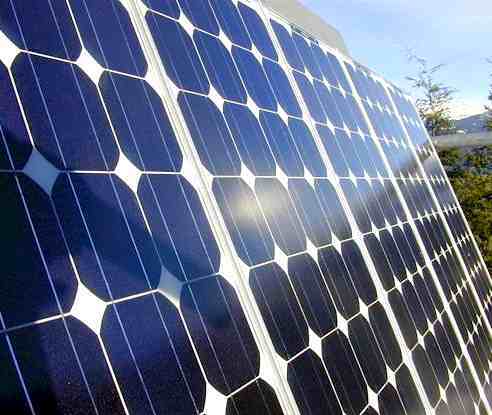 Direct solar power is the best example of the technology option and will form the backbone of this little section. However, it should be acknowledged that wind, hydro and wave power are all caused by the earth’s great weather engine which is powered almost exclusively by solar energy. Conclusions regarding solar power are therefore just as applicable to wind, hydro and wave power. In general, solar energy can be converted to electricity either directly through the photovoltaic effect (solar panels) or through thermal concentrators using mirrors to concentrate solar energy to a central point in order to drive a steam turbine (solar thermal power plants). In principle, these technologies are very simple, but the second law of thermodynamics quickly shows its ugly face when you consider the scale on which these technologies have to be rolled out in order to have any meaningful effect. On average, the surface of the earth receives about 180 W/m2 over a 24 hour period, but, because energy does not like to be concentrated, we can only get access to small amounts of this solar energy influx. More specifically; solar panels made from common materials which are sufficiently abundant for mass production typically manage to convert about 10% of the incoming solar radiation to useful electricity and solar thermal is even worse. When considered relative to the solar radiation falling on the total plant area, a large solar thermal power plant produces electricity at an efficiency of less than 3%. Solar panels therefore can generate about 18 W/m2 of electricity on average while solar thermal is restricted to about 5 W/m2. Actually solar PV farms (which require significant spacing between the panels) also have a power density of about 5 W/m2. This implies that you would need about 20 m2 of solar farm to power a single traditional 100 W light bulb 24/7 (if you also have the energy storage capacity to smooth out the intermittent nature of solar power of course). For some more perspective, consider that many modern fossil fuel power plants produce electricity at a rate of 1000 MW or more. 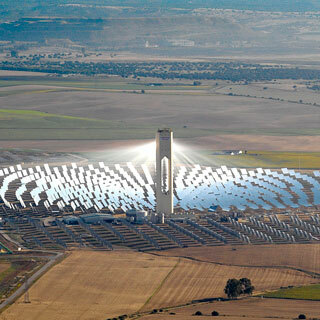 Achieving the same result through solar plants will require roughly 20000 hectares (40000 football pitches) of land covered with solar towers and steam turbines surrounded by millions of mirrors (each with its own automated sun-tracking motor and regular cleaning mechanism) to achieve the same result. As a final little bit of perspective, it must be acknowledged that it is highly unlikely that the limping global economy will be able to keep on subsidizing the projected exponential growth in solar power generation. Even China, which is striving for a solar PV monopoly through government subsidies which are so large that the US thinks they are illegal, is now slowing down. If subsidies go away, solar growth will vanish with it simply because solar electricity is projected to be at least twice as expensive as increasingly hard-to-get-at fossil fuels by the end of the decade. And yes, then it must also be recognized that today’s fossil fuel prices are already too high for achieving sustained economic growth. For example, a previous post discussed how the total credit market debt in the USA has grown faster than GDP for the last several decades, culminating in 2008 when debt grew 2.5 times faster than GDP. Naturally, if your monthly debt repayments grow 2.5 times faster than your monthly income over an extended period of time, you will not last for very long. Indeed, the fossil fuels we need for sustained growth is not the $70/barrel shale oil everyone is so excited about nowadays, but rather the $3/barrel conventional oil still being extracted in the Middle East. These super-cheap conventional fossil fuels are what built our civilization and, in the absence of such cheap energy, the only remaining path to temporary growth is cheap credit (which has predictably transformed virtually the entire developed world into one big debt crisis). For some real-world examples of the economic challenges facing renewables one can look to Germany, which now faces growing public resistance to the electricity price increases caused by renewables, and Denmark, where large-scale wind generation is helping to provide the most expensive electricity in the developed world (about 33% more expensive than their closest rival, Belgium, according to Wikipedia). Unlike Germany, however, Denmark still has wide public support for its ambitious renewable energy program (possibly mainly because they make so much money from selling wind energy technology to the rest of the world). I sincerely hope that this public support stays strong within an environment of escalating prices and dwindling economic growth. Along with water, photosynthesis is the primary reason for life on earth. Without photosynthesis, living organisms would have no way in which to absorb the energy required for daily life. In short, photosynthesis is the wonderful process by which plants can capture solar energy and use it to convert the carbon in atmospheric CO2 to high-energy carbon fuels that can be consumed as food by other living organisms or burned to release energy for human use. In common language, this option is known as biofuels. Unfortunately, the prospects of employing photosynthesis as an energy concentration mechanism are even worse than doing this through technology. While solar PV can capture about 10% of solar radiation in a form that can do useful work for humans, plants capture only about 1%. In addition, the plants need to be processed to a form that can be used as liquid fuels or for power generation, consuming large quantities of additional energy and labor in the process. 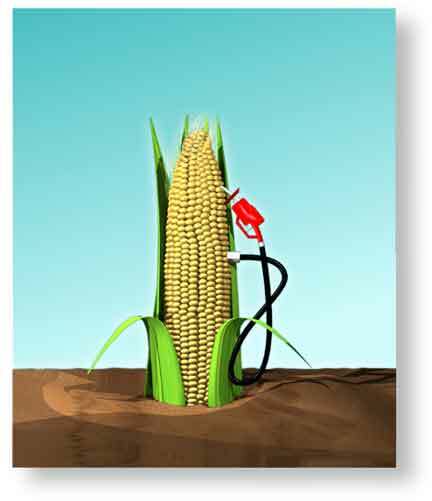 And yes, then there is of course the fact that the most common type of biofuel nowadays – corn-based ethanol – competes directly with the world’s dwindling food supplies. But hey, what about algae? Yes, it is true; a lot of recent hype has been going on about algae, primarily because of its ability to capture solar energy with an efficiency possibly even as high as 5% and the fact that it does not compete with human food stocks. However, producing algae-based biofuels on a large scale in a manner where it actually produces substantially more energy than it consumes, is cost-competitive with fossil fuels and does all this without having serious environmental impacts will be incredibly difficult. 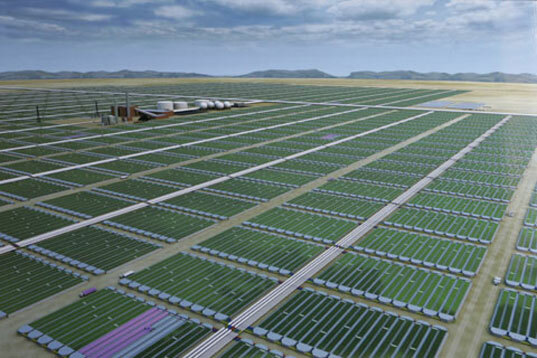 Take a look at this page to get an idea about the challenges facing algae based biofuels. With these challenges in mind, it really seems highly unlikely that 30 years of operating about 3 square meters of algae farm turns out to be more economical both in terms of money and energy than building a 1 square meter solar panel and simply letting it sit in the sun for 30 years. Yep, like so many other “miracle solutions” to our impending energy crisis, I’m afraid that algae-based biofuels will probably also run into the unbreakable brick wall called reality. In summary, I think that further economic hardship over the coming years will get society to slowly realize just how amazing fossil fuels really are. Necessity will force the common man to get a lot better acquainted with the second law of thermodynamics and finally understand the blatantly obvious: real-time concentration of diffuse solar energy (be it through solar, wind or biofuels) will never ever be able to compete on a level playing field with burning five years of ancient sunlight every single minute in the form of fossil fuels. The laws of physics simply make this a total mismatch. And yes, it is only when we accept this fundamental truth that we can really start building a sustainable energy future. But before we can start building our sustainable energy future, the next page will provide a further dose of objective reality by discussing three additional challenges faced by renewable energy (as if the second law of thermodynamics was not enough already). Excellent summary of the issues, Schalk. Did you post this after being inspired by my Entropy – an unauthorised biography (6 September 2012)? Does all this mean that Tom Blees’ nuclear – Prescription for the Planet – was right all along? James Hansen was certainly convinced by him but, if he is right, how do we make nuclear power generation low-tech and cheap-enough to prevent the creation of a new form of technological colonialism/dependency in poorer countries? The inspiration for this page came from reading John Michael Greer’s interesting book “The Wealth of Nature”. I just read your post now. It was certainly interesting although I doubt that we will see economically viable nuclear fusion technology in our lifetime. I thought I made clear that I had reluctantly conceded our need of CCS some time ago (but reserve the right to keep calling it – along with the notion of “clean coal” – fossil fuel lobby propaganda). Great its a very helpful blog. 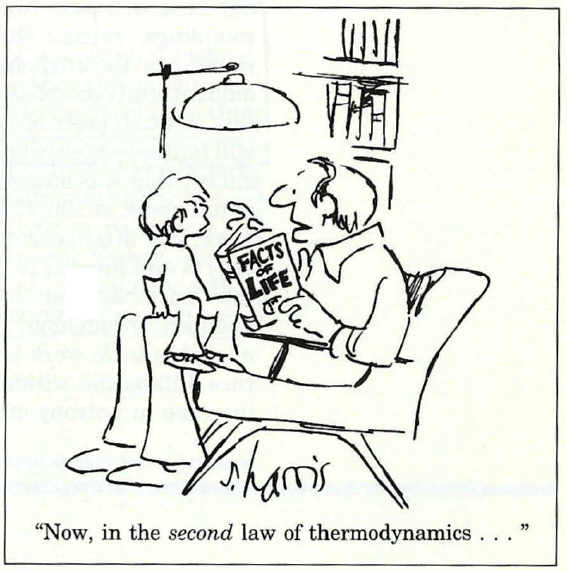 You explain the basic concept of second law of thermodynamics. There are many important points that you should explain breifly. I just read your post . It was certainly interesting. Nice one. Another way of looking at this is. The REAL economy is about energy. Always has been and always will be. The paper economy is nothing more than a quasi representation of that economy. Life is ultimately a competition for scarce energy resources. All known accessible energy sources to man are finite and rapidly running out.